The concept of energy and horses was driven home once again at a workshop with Tina Marie Barnes this past weekend. Horses do not see and feel the world in the same way that we do. Instead of identifying individual objects as trees or people or cars, they see different frequencies of energy, some moving faster than others. A moving object, such as a leaf or a plastic bag, could therefore easily be misconstrued as a living thing as the frequency is the same, and provoke the flight response in even the calmest of horses. This truth is accepted (as we have all experienced a horse who has jumped out of their skin at a leaf or a piece of paper) but very hard to understand for the human mind. From a young age, horses are taught by their mothers about the ways of energy. Energetic boundaries or lack thereof between horses and their herd mates, the innate ability to sense danger, and the uncanny knack at identifying incongruency are only a few examples. If you watch closely, you may also notice that the way a mare takes care of her foal is remarkably similar to the way an energy healer works. She will naturally hold certain areas of the body or rub the spine, or move her foal’s head up and down with her neck. It may be a stretch, but one might assume, from the distinct areas she is working with, that she is helping to balance her colt’s energy centres. In the horse there are 8 main energy centres located in the body, each relating to different areas of the body, different ailments and different behaviours when out of balance. These energy centres are also known as chakras. A chakra is described as an energy hotspot, usually located along the centre line of the body, which communicates with all the other centres about the overall health of the body, mind and spirit. In this way, an imbalanced chakra may display imbalance not only physically (eg. Shifting lameness in the front legs) but also emotionally (eg. Lack of zest for life) and behaviourally (eg. Resistance, girthiness). Balancing your horse’s energy centres will go a long way towards their overall health and well-being. There are major benefits for the digestive tract and the functioning of all the internal organs and systems as a whole, as well as the structural system. In fact, the benefits are increased by the fact that this re-balancing is not only working on the physical level, but also helping emotionally, mentally and behaviourally to decrease stress, restore zest for life and increase feelings of safety and willingness. It is a common belief that there are only certain people that can do energy work or healing. Happily, this is far from the truth. The reality is that anyone with a positive intention can help their horse to feel healthier and more balanced. After all, we are all made up of energy and are each capable of using this energy in a positive way. In fact you can positively influence the harmony of your horse’s energy centres just by holding a hand over them with a positive intention (visualize what you would like to happen in this area. For example, I visualize enhanced flow, balance and harmony) and an open and present mind. Make sure to listen for body language and signs of release. Incredibly, your horse will tell you exactly where to hold and for how long if you are able to pay attention. Signs of release indicating a return to balance include licking and chewing, sighing, yawning and even a bowel movement. In the horse, there are 8 main energy centres, beginning with the root chakra (red), then the sacral chakra (orange), solar plexus chakra (yellow), heart chakra (green), throat chakra (blue), brow chakra (indigo), and crown chakra (violet). Each chakra has distinct qualities, but is intrinsically connected to all the other chakras. Working with one chakra, therefore, can only enhance the balance and functioning of all the other chakras. Here is my mare Diva modelling the location of the 7 main energy centres beautifully. The root chakra (red) is often referred to as the first chakra, as it is the main chakra displayed when we arrive into the world. As a baby or a foal, this chakra is working non- stop to ensure our survival. Food, shelter, family, and general safety are just some of the priorities of this chakra. We have all met horses that are experiencing imbalance in the root chakra. These are the horses that are constantly on the look-out for danger, who are bound to their herd, who have trouble feeling safe and calm outside of their comfort zone, and who display aggression over food. It can also be related to physical imbalances of the spine, kidneys, adrenals, and back legs. When balanced your horse feels calmer and more able to adapt to his surroundings without reverting to survival mode. To help balance this chakra for your horse, place your hand gently at the tail head and hold. Your horse may lift their back legs or shift weight several times and should display some sort of release (licking/chewing/yawning). This release is a good indication that the chakra is beginning to return to its balanced state. The second chakra is often referred to as the sacral chakra (orange). This is the chakra which is responsible for our creativity and sexuality, and when out of balance it can translate into digestive or hormonal imbalance, lower back pain, bladder problems or even issues with possessiveness or jealosy. It is located in horses in the area across the hips. The third chakra is the solar plexus chakra (yellow). A chakra related to self-esteem and confidence, willingness, and digestion of experience, this chakra shows its imbalance through lack of will, low energy, digestive discomfort and overall toxicity. To balance gently run hand up and down spine or place hand on belly area several hand widths behind the front legs or just behind the withers. This balancing technique is very effective for any horse experiencing digestive discomfort as it works to re-establish harmony in the digestive and elimination organs. The fourth chakra is our balancing energy centre, the heart chakra (green). 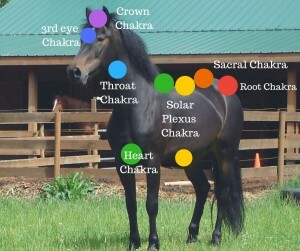 This chakra is often out of balance when a horse is grieving (eg. Foal separated from mother), or when they have experienced past abuse. By drawing attention to this chakra through energy work it is possible to release some of this trauma. It is also related to the thoracic vertebrae, heart, lungs, and immune system. You can access this centre from between the front legs, the front of the chest, or just before the withers. The throat chakra (blue) is located in the upper throat area (just behind ears and jawline in the horse). It is related to expression and communication, and translates physically into the health of the front feet and forelegs, respiratory system and throat area. The sixth chakra is often referred to as the brow chakra (indigo) and is located directly between the eyes. Reponsible for intuition and concentration, an imbalance in this chakra may display itself in the nervous system, eyes, nose, or in headaches and a lack of concentration. Place your hand directly between the eyes to help to balance, remembering to hold until a release is felt (your horse may resist your hand in this area). You may have to wait until the other chakras have been worked on before your horse is accepting of work here. The seventh chakra in horses is called the crown chakra (violet) and is related to wisdom and connection. This chakra is aptly located on the crown of the head, or in horses, directly behind the ears. When out of balance your horse may display a feeling of depression or lack of energy or excitement. On a physical level, they may be experiencing a headache or a sensation of being foggy headed. Some equine energy experts believe that horses have an eighth energy centre not present in humans called the brachial chakra (white). This energy centre is located at the junction between the shoulder and neck and is important for any horse who has experienced trauma in their lifetime. Bringing these energy centres into greater balance will help to increase flow and harmony in the body, mind and spirit of you furry friends. This is only one aspect of health, but it is a great beginning, and a wonderful way to connect to your horse and create greater partnership and understanding. Digestively speaking, working regularly with your horse’s energy centres will decrease stress on a physical and emotional level and improve flow and function of the entire digestive tract. Just think positively, keep an open mind, and most importantly have fun! Hold your hand over the area and send lots of love and good vibes, imagining the energy centre balanced and harmonious. Yes, even you can be a Jedi. Use an awesome flower remedy blend like Balancer Essence from Pacific Essences – spray it on your hand and rub it gently into the area (this one is a must for every first aid kit!). Work with a trained practitioner – you’ll learn a ton and you’ll have the peace of mind of knowing that your horse is happier and healthier. Learn how to do Applied Kinesiology or use a pendulum. This is one of the coolest ways to figure out which energy centres need love and attention and what is needed for balancing. Handily, my Kinetic Communication course is now available online, just in case you don’t live on Vancouver Island (it is a rather small place after all!). Head here for all the details on how to start learning! Happy trails until next time.